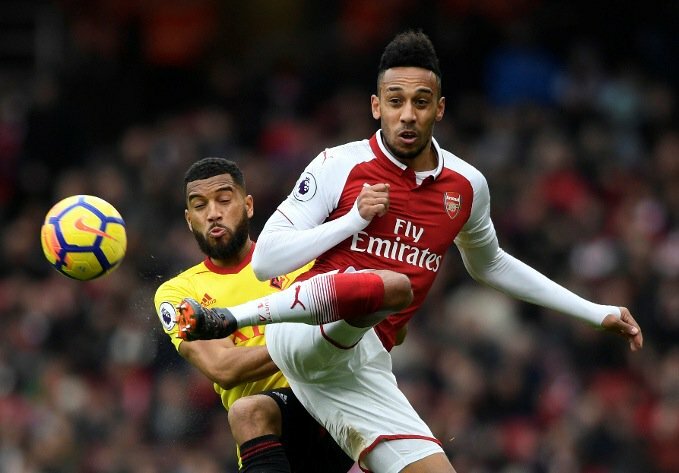 Pierre-Emerick Aubameyang believes his ‘frustrating’ start to life at Arsenal is due to his unavailability for the Gunners in the Europa League. The Gabonese striker cannot play in Europe’s second tier competition due to representing Borussia Dortmund in the Champions League and the Bundesliga side subsequently dropping into the Europa League. The 28-year-old scored on his Arsenal debut in a thumping 5-1 win over Everton. But he then went three games without a goal as Arsene Wenger’s side lost successive matches 3-0 to Manchester City, including the Carabao Cup final, plus a 1-0 defeat at Wembley in the north London derby. He netted in the 2-1 loss at Brighton earlier this month before helping Arsenal to a 3-0 win against Watford on Sunday. And Aubameyang believes he has struggled for rhythm due to having a week between games. “I am really frustrated because the rules are a bit… I don’t know how to say in English but I am disappointed because I can’t help my team,” he said. “When I was in Dortmund, I was playing every three days but now I play once a week or have a long time between games. It is not easy… that’s life. I have to deal with it.